With spring in full bloom, all types of flora and fauna are showing their colors for the new season. In Washington, DC, people come far and wide to enjoy the National Cherry Blossom festival, a celebration of the beginning of spring and culture. It is meant to commemorate the gift of 3,000 cherry trees to DC from the mayor of Tokyo, Yukio Ozaki, in 1912, and celebrates the relationship between the United States and Japan. Starting March 20, there are a multitude of festivities to celebrate the blossoms and the coming of spring. The opening ceremonies take place on March 24, and include performances from many different groups celebrating traditional and current japanese culture. There are orchestral shows, traditional dances, light shows, and more throughout the day. Another big event is the blossom kite festival on the grounds of the national monument. People come from far and wide to show off and compete with their complex and beautiful kites. There are also classes and demonstrations for people who want to join in the fun, even if they are beginners. By far the biggest celebration is on April 6, when the cherry trees are in peak bloom. Petalpalooza is full of live music, interactive activities for all ages, vendors, and even a firework show. There are multiple outdoor stages, and the event is free for all ages. The fireworks show is at 8:30pm, but the event goes until 12pm. There is something for everyone all around the wharf, and is the epicenter of the cherry blossom festival activities. The blossoms are predicted to be in peak bloom April 3 – 6, but the bloom time can change depending on the weather. The festival doesn’t officially end until April 14, and there are activities going on up until the last day. Volunteers recommend planning your trip with crowds and restaurants in mind because many places will be full. 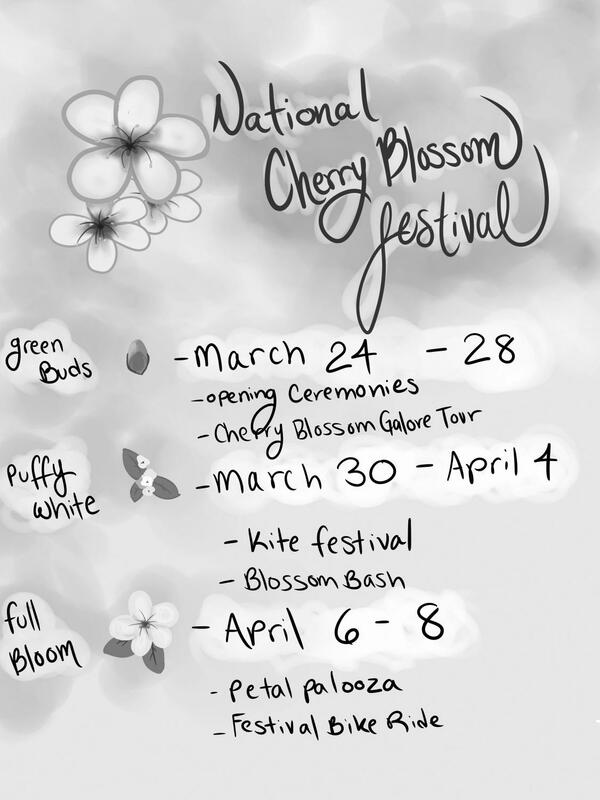 The official website, nationalcherryblossomfestival.org, has the full list of activities and events, as well as places to eat and stay during the festival. It also has a bloom watch, so you can see the cherry blossoms when they look their best.